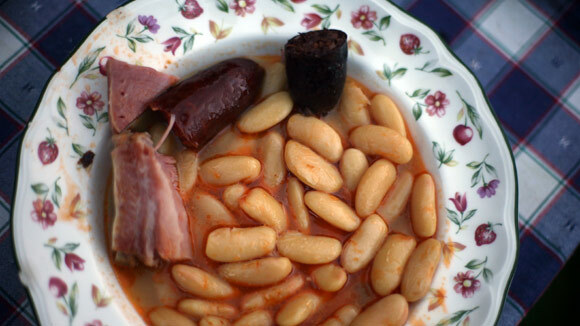 Fabada is adored throughout Spain, and it should be adored throughout the world. It's an Asturian preparation of fabas (dried fava beans) of the granja (farm) variety and a whole slew of pork products. Drain the beans. Put them in a large pot, add water to cover by 2 inches, and bring to a boil. Skim off any foam, lower the heat to a simmer, and add the olive oil, saffron, pimentón, garlic, ham hock, and bacon. Simmer for 1 hour, adding more water as necessary to keep the beans covered. Add the chorizo, morcilla, and onion and simmer for another 2 hours, or until the beans are very soft; add water as necessary to keep the beans and meats covered. Remove from the heat, remove the meats, and let cool slightly. Remove the meat from the ham hock and shred it into bite-sized pieces. Cut the bacon into 1-inch chunks and cut the sausages into thick slices. Discard the garlic and onion, ladle the beans into bowls, and nestle the various meats in the beans.